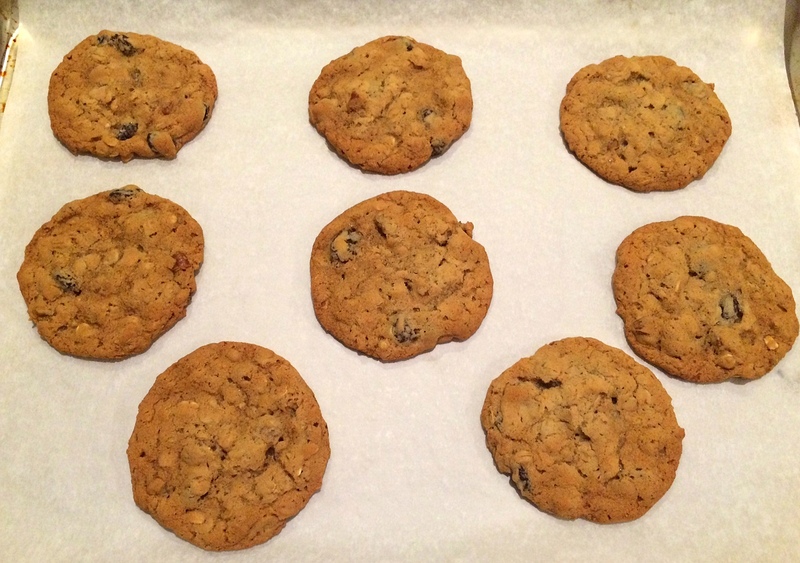 I was not a fan of oatmeal raisin cookies -- until I tried this recipe. It is that good. 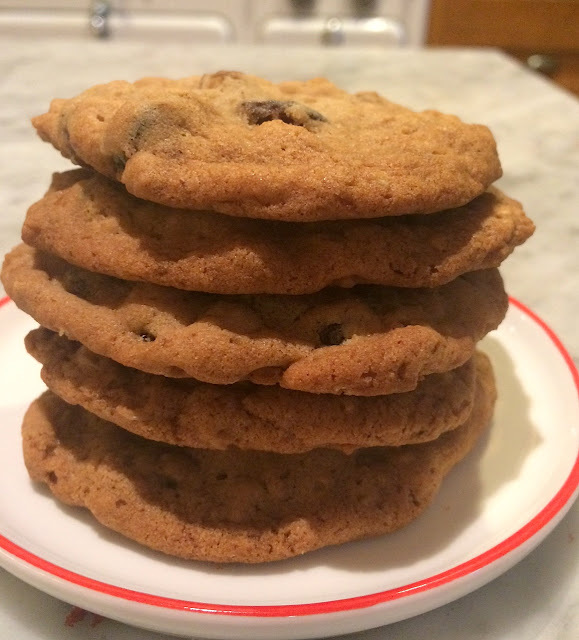 While I typically bake desserts I love (you'll notice a dearth of recipes with peanut butter on this blog, for example), sometimes I do bake only for others. Like last week, when I wanted to thank my boss for an unnecessary (but wonderful and much appreciated!) gift basket. 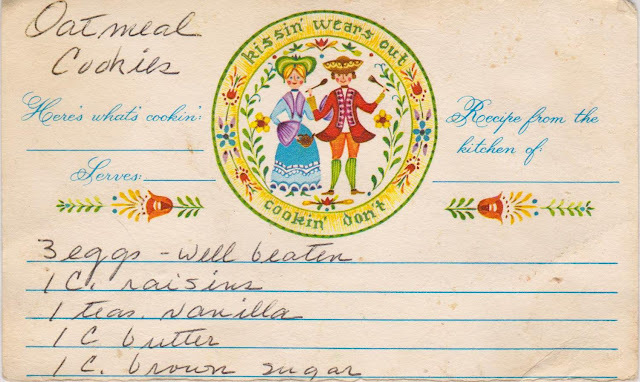 I found a rather intriguing vintage recipe from my collection, but egads! half of the recipe card was missing. 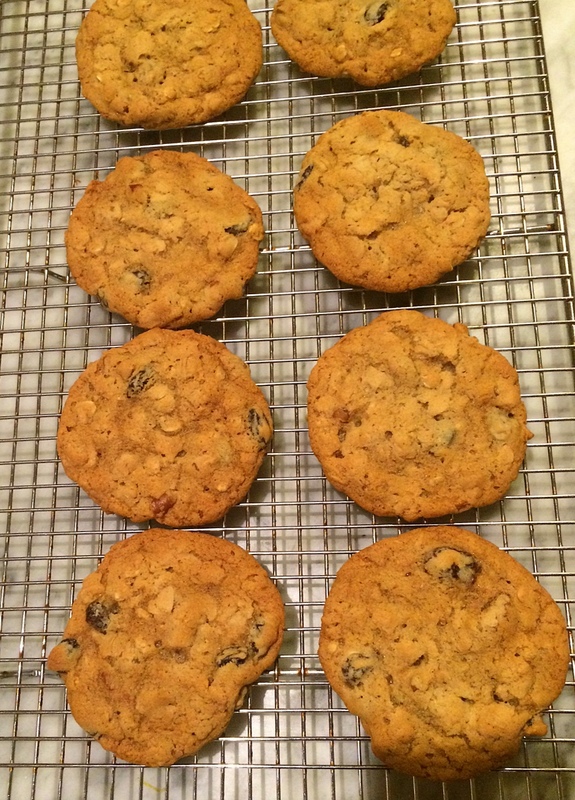 So, I Googled "best oatmeal cookie recipe" and first up was the exact same recipe! 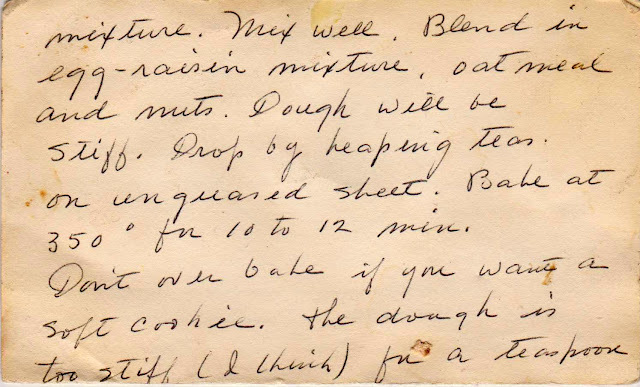 The contributor to Food.com noted it was an old recipe that she'd had for years, but didn't know its origin. The secret to the cookies' deliciousness is in the first step -- soaking the raisins in the beaten eggs and vanilla for an hour. A simple, yet transformational technique that I've never seen elsewhere. 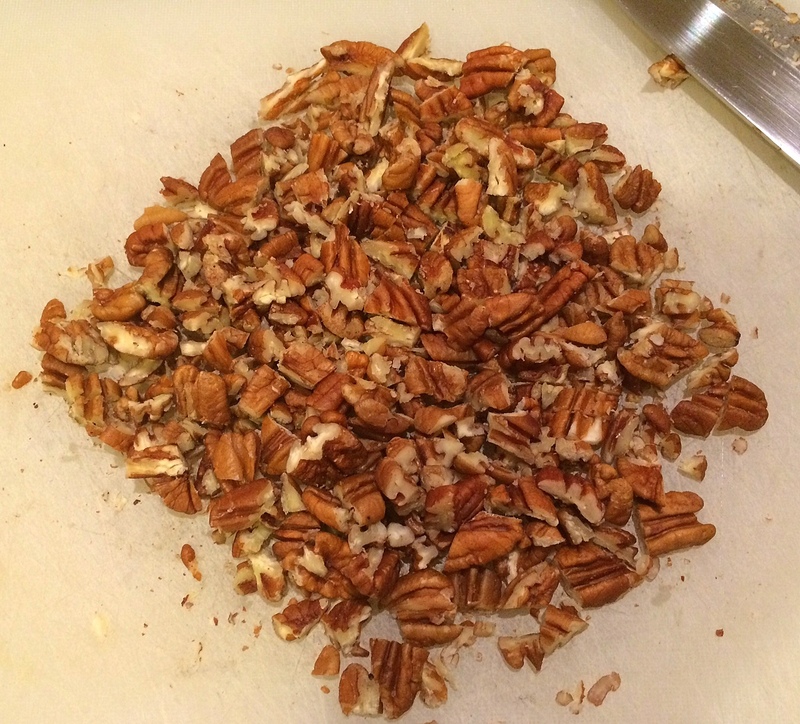 These also feature pecans, a lovely addition to many a baked good. The dough is um, rather firm. 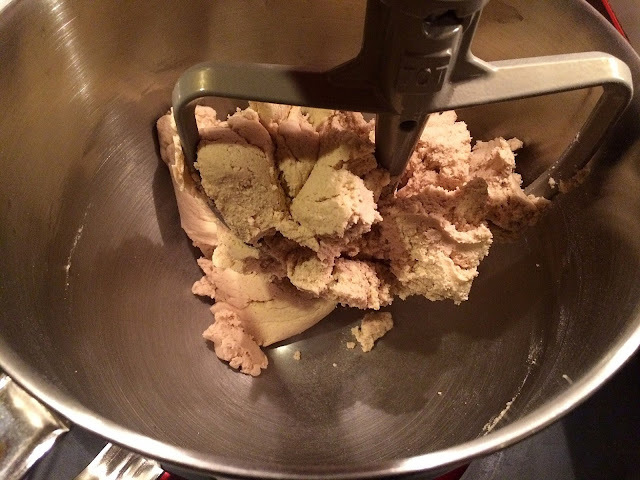 I somehow neglected to photograph the easy way to form the cookies, using a small ice cream scoop. Otherwise, two spoons or your hands would work fine. I patted the dough to flatten slightly once on the baking sheet. Bake for about ten minutes, and cool on a rack. 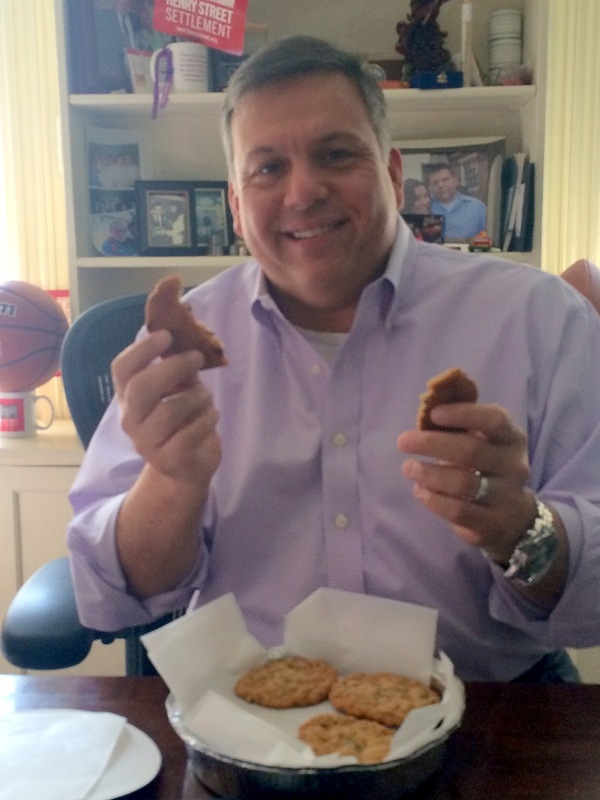 Below is my boss David, thank-you cookies in hand. The flavor was so fabulous, that after one bite he was overcome. Here's the recipe card; as you can see, it's missing some essentials (a list of all the ingredients, and some instructions). 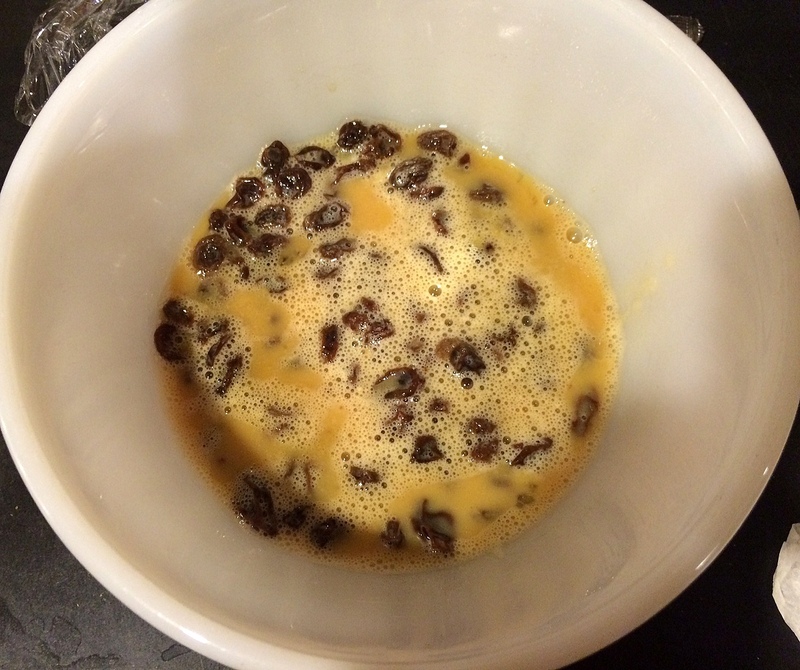 This is a very important first step that makes the cookie: combine eggs, raisins and vanilla and let stand for one hour. Add flour, salt, cinnamon and soda and mix well. Blend in egg-raisin mixture, oatmeal, and chopped nuts. Drop by heaping teaspoons onto ungreased cookie sheet, or roll into balls and flatten slightly. Bake at 350 degrees for 10 to 12 minutes or until lightly browned. I left the raisin mixture on the counter, and I do think that soaking is the secret. I also used old-fashioned oats. 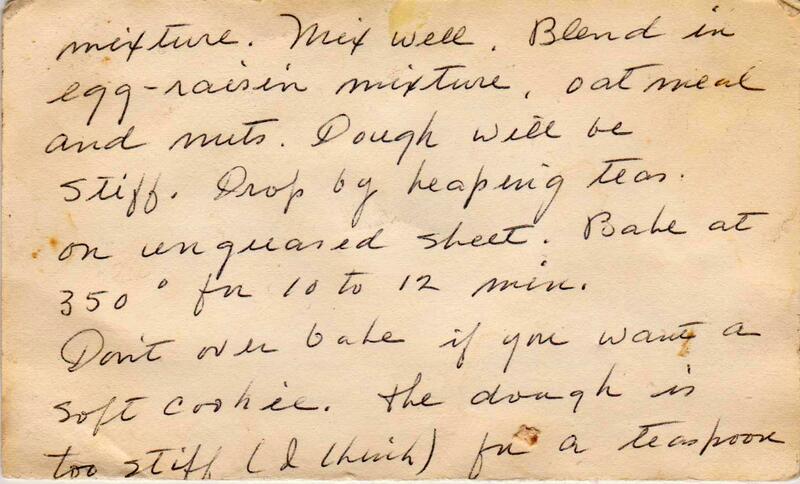 Cranberries are generally much more moist than raisins, so I'm not sure what soaking would do. But if you do try it, please post the results! Thanks for writing. These are the best cookies ever! Brought a tray of them to work and everyone raved about them. Even those that do not like raisins loved these cookies! So glad they were a hit, JoAnne. Thanks for writing. 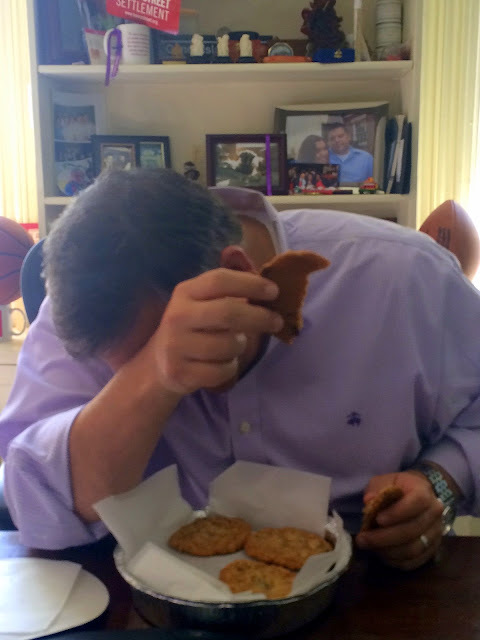 Don't you just love it when someone is overcome by your baking? It's the best feeling to make something they love! I will have to try this recipe. The raisin soaking sounds genius. Ha! That's what life's all about, beckster!! Thanks for writing.